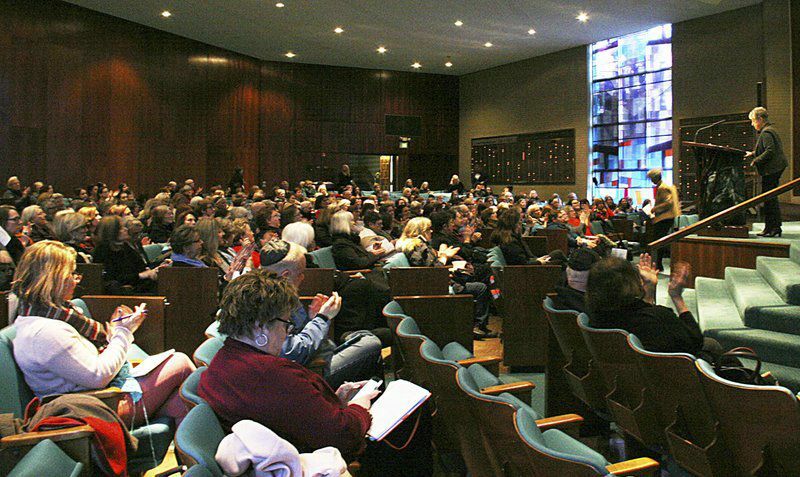 PACKED HOUSE: Sheila Suess Kennedy, a professor at Indiana University-Purdue University Indianapolis, spoke at a Women4Change event on March 14 at Congregation Beth-El Zedeck in Indianapolis. Women4Change was started by Zionsville businesswoman Jennifer Nelson Williams. PINK HATS: Sharon Sperry and Rachel Sipes, both of Indianapolis, wore pink hats knitted by Sperry to the March 14 Civic Literacy event. Like many, Jennifer Nelson Williams and Sandy Sasso were concerned about the state of their country after the 2016 election. Like many, they took to social media to create an online-based group of women who shared their concerns. Unlike many, the group ballooned to nearly 11,000 members, pulling in supporters from around the state who have attended rallies and workshops and volunteered to run task forces. The group got its start in November, shortly after the election. Sasso and Williams, who is the funeral director at the Aaron Ruben Nelson Funeral and Cremation Services in Zionsville, both had grown concerned about the vitriolic rhetoric on display for the months leading up to President Trump’s victory. They decided to reach out to the community to see whether any other women shared their fears. The pair put together a panel on women’s issues that featured Betty Cockrum, president of Planned Parenthood of Indiana and Kentucky; Christina Hale, the Democratic contender for Lt. Governor; and Sheila Suess Kennedy, a professor of law and public policy at Indiana University-Purdue University Indianapolis. They expected about 100 women to attend the panel set to take place at the funeral home. About 900 showed up, only 500 of whom could fit in the room. Williams said all plans went out the window. She and Sasso ended up passing around index cards, asking the huge crowd of women to write down their top concerns about their state and nation. • Dignity and safety: This group focuses on women’s health and safety concerns, reproductive health and LGBTQ rights. • Mentor and empower: This task force works to empower women to take on political leadership roles at the local, state and national levels. • Inclusion and civility: This group fights racism and promotes civil discourse in politics. • Restructuring and activism: This group fights to reform redistricting in Indiana and supports voter rights and civics education. Huge numbers of women began volunteering to head the task forces. A group of volunteers, calling themselves “Lawyers 4 Change” provide legal services to the group, while a group of volunteer accountants have helped file tax forms. A Women4Change member designed their website for free. Williams said that group members have come forward to help every step of the way. In January, only about two months after the group’s founding, Gov. Eric Holcomb invited Women4Change’s leaders to meet with him on his inauguration day. Williams and the other women took his advice to heart. Ask any leader in Women4Change why the group’s message has proved so potent and they’ll all tell you the same thing: civility and inclusion. I pledge to be civil and respectful in my public discourse and behavior. I will do this for the sake of our children, for the healing of our country, for the future of democracy and peace. Sasso points out that the group makes an effort to include women from all religious, racial and political backgrounds in its leadership. The group actively seeks out Republican voices, finding value in civil discussion and differences of opinion. The members don’t have to fall completely in line with Women4Change’s values to join, Williams said. She believes that the members’ shared experiences as women means that no difference of opinion is insurmountable. When a friend told Williams that they were on different sides of an issue, Williams pointed out that that may be true, but that at the root they have something in common. Another reason group leaders believe that Women4Change’s message has resonated with so many people is that it partners with well-established organizations to promote issues important to them. Partners include the Muslim Alliance of Indiana, Jewish Community Relations Council, Freedom Indiana, American Civil Liberties Union of Indiana, Planned Parenthood and the National Organization for Women, among others. Women4Change amplifies the needs of these organizations, rather than “reinventing the wheel,” Williams said. The partnerships have brought Women4Change members to the airport to protest President Trump’s immigration policy and to work toward getting a hate crimes bill measure passed in Indiana. As the group grows, the organization leaders have begun to discuss several innovations, including a statewide book club that would read books from diverse cultures; a speaking bureau to train women to give presentations on Women4Change around the state; a leadership series to train women in running for political office; a civility campaign for legislators; and a database for the organization’s members. The biggest project of all, however, is to create Women4Change chapters in every congressional district in the state. Williams said that she has heard from people in Fort Wayne, Evansville and even Florida asking her about starting their own Women4Change chapter, but for a while turned them down. “Initially it seemed like a wild dream. … I answered back that I’m just a mom in Indianapolis,” Williams said. But in the last month that dream, of becoming what Holcomb’s staffer called a “force,” has become a reality. Chugh said that she plans to visit each congressional district to hold informational sessions and to visit with local women on the interest in starting a chapter. Then it will be a matter of setting up the infrastructure within those groups and determining their relationship to the larger Women4Change base. Having nine chapters throughout Indiana will strengthen not only the organization, but women who want to become more involved in local politics but do not have a solid support system, Williams said. As the chapters are rolled out in the coming months, Williams said that she expects Women4Change to grow by tens of thousands around the state. “When we voice our concerns, people are going to listen,” she said. Williams and Sasso both said that they spend so many hours on Women4Change that it has become like a full-time job. But neither would give it up.